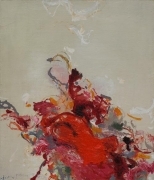 James Cohan Gallery Shanghai is pleased to present an exhibition of paintings by three Chinese artists: Huang Yuanqing, Ouyang Chun and Shi Zhiying. The exhibition opens on July 6th and continues through August 31st, 2013. An opening reception will be held on Saturday, July 6th, from 6 to 8 p.m. “The true mystery of the world is the visible, not the invisible.” Oscar Wilde once wrote. The three painters in the exhibition share something in common with Wilde’s statement, as each of their dynamic and diverse style bridge the physical and cerebral world. 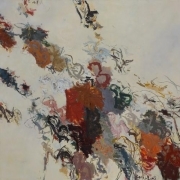 A unique and leading figure of abstract art in China, Huang Yuanqing integrates Eastern and Western techniques and approaches to abstract painting. Skilled as a calligrapher, Huang’s paintings take a contemporary literati position, working from the traditional concept that painting and calligraphy stem from the same source. 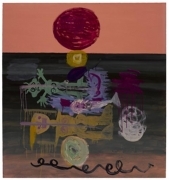 Guided by line, profuse layers of color and textures, Huang’s intuitive language emerges slowly, appearing flexible and yet precise, guided by a rhythmic intelligence leading each resulting work. Contrary to the principles of calligraphy, however, Huang’s paintings are created over a period of time, sometimes taking months or even years, suspending his process and output, and thus allowing time to play a critical and essential role in the completion of a finished work. Ouyang Chun is well known for his subconscious investigations and diary-style narration. “Much of the time,” the artist has stated, “I’m painting to explain myself, not simply to explain the painting process.” Ouyang depicts urban and social life with a critical and sometimes mischievous eye. 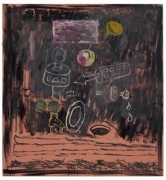 His paintings feel closer to outsider art, connected to folklore, and are often based on the idea of excess and accumulation. A network of images and objects fuse, seemingly random, but embody their own symbolic power, order, and universal significance. No image or object is taken for granted. 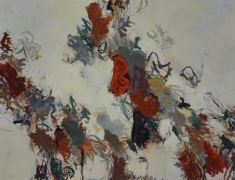 Like many of the artists of his generation, he discarded political themes early in his development, seeking the greater potential in self-expression and personal psychology. The world of children, kings and queens, whales, mythological legends of the world and all who inhabit it, are central to Quyang’s works that consciously avoid any definitive style, giving free rein to the inner world of the artist. 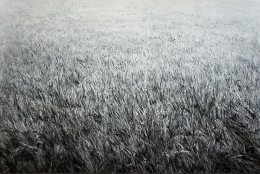 In contrast to the other two artists, Shi Zhiying is known for her stark black and white oil paintings of vast monochromatic vistas of the sea, endless landscapes of scattered rocks, traditional sand gardens, and intricate blades of grass. Shi’s paintings are deeply visceral and contemplative, and summon intense reflection on individuality and the passage of time. The featured work in this exhibition is the painting The Infinite Lawn, which was the pivotal work in her solo exhibition at the Shanghai gallery last year. Shi will have her first solo exhibition at James Cohan Gallery in New York this month, where she will debut her latest body of work, The Relics, inspired by the artist’s travels in China, Cambodia, and India. 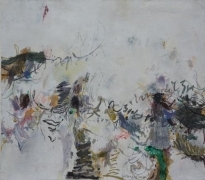 For more information on Shi’s New York solo exhibition visit the website www.jamescohan.com. Huang Yuanqing (born in Shanghai, 1963) In 2012, Huang Yuanqing held his major solo exhibition at Galerie Albrecht , Berlin; 2010, Xing Xiang, Zhang Jiang Contemporary Art Center, Shanghai; 2007 Move Closer, gallery of Bangkok University. 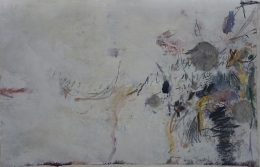 His works has been featured in recent outstanding group exhibitions, including 2013 Xinshenhui, Bund 22 Art Center, Shanghai, China; 2012, Munich Art Exhibition, Munich;2011 Metropolitan Abstraction, Art Front Gallery, Tokyo, Japan; 2010 Sea inst Level- Abstract invitation exhibition, Shanghai oil paintings & sculpture institute, Shanghai, China. Ouyang Chun (born in Beijing, 1974) graduated from the Department of Art Education of Xi’an Academy of Fine Art. Ouyang Chun exhibitionsly lives in Beijing. He hold his major solo show 2012, Child, in Today Art Museum, Beijing, China; 2011, Painting the King, Belvedere- Upper Belvedere & Augarten Contemporary, Vienna, Austria;2009, Ouyang Chun- Paintings 2007-2009, Galerie Frank Schlag & Cie, Germany. Ouyang Chun also participated distinguished group exhibitions: 2013, Evolution—Avant-Garde contemporary Art Center Opening Exhibition, Avant-garde Contemporary Art Center, Nanjing; 2012, The 9th Shanghai Biennale, Shanghai, China;2011 Future Pass- From Asia to the World, Abbazia di San Gregorio, Venice, Italy; 2010, The Official Opening of Minsheng Art Museum- Thirty Years of Chinese Contemporary Art, Minsheng Art Museum, Shanghai, China. Shi Zhiying (born in Shanghai, 1979) graduated from the Oil Painting Department, Shanghai University Fine Arts College. In 2009, the artist was the subject of a major solo exhibition entitled From The Pacific Ocean to the High Seas at the Ullens Center of Contemporary Art in Beijing. Her work has been featured in distinguished group exhibitions including Reactivation- the 9th Shanghai Biennale at Power Station of Art, Shanghai, 2012, N Minutes Video Art Festival, Shanghai, Decade of the Rabbit, White Rabbit Gallery, Sydney, and DAS ICH IM ANDEREN, Stiftung Mercator, Essen, in 2011; Double Act – 2010 Chinese Contemporary Art Exhibition, Red Town Warehouse, Shanghai, and Centennial Celebration of Women in Art, Shanghai Art Museum, in 2010; and in solo exhibitions at James Cohan Gallery, Shanghai, in 2012, and White Space, Beijing, in 2010 and 2012. She exhibitionsly lives and works in Shanghai.